history of Nastaliq and its inventor, the fourteenth century calligrapher Mir Ali Tabrizi, I realized how, despite the long tradition of abstraction in Arabic, Persian and Urdu calligraphic traditions, I had not come across examples where the letters of a word were written non-cursively – that is, detachedly – while retaining their connection as a word. In all calligraphic fonts, the initial, medial, final and isolated forms of the letter have notations. Creating a non-cursive script is impossible without breaking the script’s integrity and doing away with the variant notations of each letter, which is why the calligraphers have not employed it as a system, although standalone letters are often used as design elements in calligraphic art. A non-cursive font would also make learning the Urdu, Persian and Arabic languages much simpler, as the majority of the world’s languages follow a non-cursive script. The ligatures of the cursive scripts are an additional challenge in learning languages that use the Arabic script. To explore the idea of a detached script, I made an attempt at designing new shapes for the letters of the Urdu alphabet, to be written non-cursively. Since the Urdu alphabet set contains the Persian and Arabic letter sets, it could be used for all three scripts. The first few letters came out in shapes resembling the form of fish, and as I liked their appearance, I consciously tried in the interests of uniformity to keep that as a design feature for the rest of the letters. This final version materialized in a set of letters I named the Khat-e Mahi (Fish Font) whose rough drawings are reproduced in Figure 1. Once the integrity of the script was broken, the letters could be written not just right to left but also downwards, at an angle, in a circular formation, and across any grid, allowing written words to intersect and overlap where words can be formed. It would also allow for the integration of two or more words or lines of text even as they intersect each other. However, as I began making words with the Khat-e Mahi, I realized that as a design font the roundness of the Khat-e Mahi letters did not give it the solidity of form that I wished. I left it where it was and nothing much happened on the design front for several years as I became occupied with my writing and translation work. Then in 2012 I thought about designing a Scrabble-like board game for the Urdu language to popularize its use among children. For such a board game one needed a non-cursive, detached font, in order to have only one shape for each letter. Once again, I thought of the Khat-e Mahi and considered whether it could be employed for this purpose. But I was still not happy with how the letters looked arranged into words. A year later, in 2013, while discussing a joint design project with the fashion designer Sonya Battla, I designed a completely different non-cursive design font. 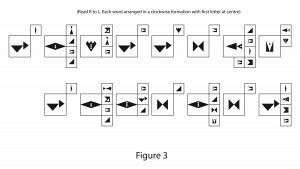 As the letter shapes were triangular, resembling arrowheads, I named this new font Khat-e Paikan (Arrowhead Font) shown in Figure 2. The strong geometrical shapes of the letters in Khat-e Paikan made it more flexible for writing in different ways. 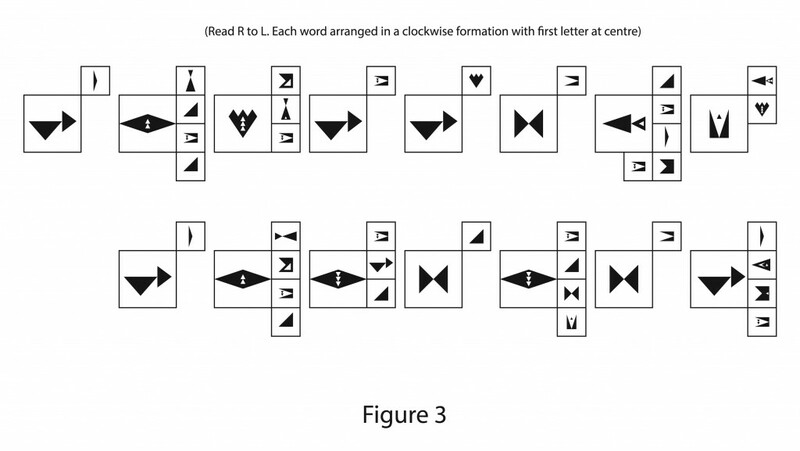 As can be seen, the first letter of each word is enlarged and centralized, and the succeeding letters wrapped around it in the clockwise direction in a geometrical grid. The experiment with these design fonts made it easier to understand both the issues of balance in designing letters and the importance of shapes that can be easily read and joined in the mind when written in any convention – left-to-right, top down, and in circular, curved or angular grids. This finally led to the design of another non-cursive design font which I named Khat-e Munfarid (Distinct Font) [Figure 4]. The diacritical marks were not meant to be a feature of this font although the hamza was included. The following example given in Figure 5 illustrates how the same couplet by Ghalib is rendered in the Khat-e Munfarid. The work on refining the fonts and designing new ones continues and one hopes there will be more experiments in this direction. It is important for a number of reasons. These reasons have to do with developing uniform standards of Urdu orthography, which have suffered because of no clear separation between conventions of calligraphic art and the science of the script, and the absence of any style book for Urdu universally adopted to set the imla standards. It also has to do with making the script more flexible and adaptable for different usages, such as electronic communications, board-games, etc. And finally, it can simplify learning the script for both native and non-native speakers of the language, helping Urdu literacy. The publishing industry in Pakistan overwhelmingly uses the Nastaliq, and recently there have been efforts to adopt it for electronic communication as well. A variety of Nastaliq fonts are available for Urdu, but they do not provide the aesthetically pleasing uniformity in reading of the Naskh based fonts in electronic format. In view of the complexity of the cursive script, people increasingly choose Roman Urdu to communicate electronically. Through advertising and marketing campaigns this trend has now moved from electronic media to print media. It is an instance where complexity of script and the insistence on the use of Nastaliq has proved a detriment in the adoption of a language for electronic media. It is interesting to note that those who were at the forefront of Urdu printing in the 19th and 20th centuries preferred Naskh fonts for printing; and that the Iranians, too, who have a longer association with the Nastaliq, prefer Naskh for printing purposes. In Pakistan, the printing industry remains very small, and until recently, employed scribes with no major investments made in developing moving fonts for Urdu script. The all-important, mechanical stage was never fully crossed, except by a few institutions like the Majlis-e Taraqqi-e Adab, Urdu Lughat Board, Markazi Urdu Board, Urdu Science Board, and a few others, who have also abandoned it since. In recent years we seem to have made our choice in favour of Nastaliq, and it will take us further away from experimentation with non-cursive fonts for Urdu. For simplicity and flexibility, and even in the interests of literacy, it is important to have the option of a non-cursive letter set for the Urdu script. These design fonts are not an answer but merely an exercise in forcing the eye to see the script in a non-conventional form. The degree of legibility will increase with simplicity of design and wide usage.